Hey, We are presenting here an awesome article on supply chain and it’s management. You will get here complete information about supply chain. Below you will read about what is a supply chain, the Basic supply chain for a product, strategies, flows, examples i.e. supply chain in manufacturing and supply chain in services. 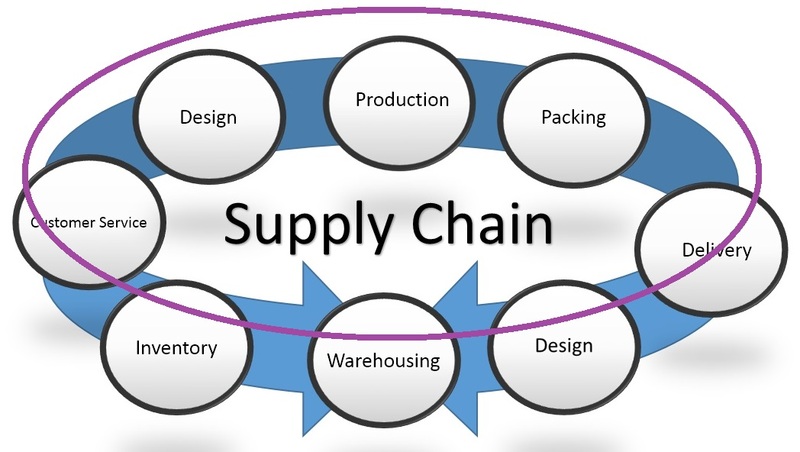 You will also read about types of the supply chain such as vertical & horizontal supply chain management, it’s benefits, differences, stages and most important, what is supply chain management with proper definition and example. A supply chain is a global network used to deliver products and services from raw materials to end customers through an engineered flow of information, physical distribution, and cash. The figure here illustrates a very basic supply chain with three entities, a producer with one supplier and one customer for basic flows that connect the supply chain entities together are as follows – flow of physical materials and services from suppliers to the end customer, flow of cash from the customer to the raw materials supplier, flow of information back and forth along the chain and reverse flow of product returned. A basic supply chain in this figure is made up of these entities. Seller is a supplier who provides goods and services or a person or organization with whom the buyer does business, their generic term in marketplace is sailor. Supplier provides materials, energy, services or components for a product or service such as plastic, fabric, electric, wiring or aircraft. Producer is the one who receives components from the seller to produce a finished good or service such as shirts from fabric, crockery from plastic, power from electric wiring or provides transportation through aircraft. The customer is the one who receives the finished product that is the one who wears those shirts uses the crockery turns on the lights or flies in an aeroplane. There are three types of supply chain strategies stable, reactive and efficient reactive. Stable Supply Chain Strategy is appropriate for chains that are focused on execution, efficiencies and cost performance. they use simple connectivity technologies and have little need for real-time information for example table salt manufacturer uses scaled production and dedicated capital assets. Reactive Supply chain Strategy works well when the chain acts to fulfill demand from trade partners, for example manufacturer a sports team apparel for fans. when it seemed makes it to the next round more products are needed however for the losing team demand virtually disappears. Efficient Reactive Supply Chain Strategy focuses on the efficiency and cost management on the total delivered cost of finished goods, for example in supermarket chains distribution centers, logistics providers and manufacturers cooperate to replace the goods sold in the shops within less than 24 hours. There are four flows in supply chains. Information flow includes invoices, sales literature, specifications, receipts, orders and rules and regulations. Primary cash flow includes payments of products and supplies. Primary product flow includes materials, components, supplies, services, and finished products. Reverse product flow includes returns for repair, replacements, recycling, and disposals. Consider a supply chain model of a bakery who sells a variety of cakes and this Baker is one end of a supply chain in this case a supplier is a wholesale food distributor that provides ingredients such as flour cream and sugar. the bakery is the producer who turns those ingredients into a variety of cakes. the bakery is operated by an owner who is the retailer and who sells these cakes to the customer. Consider a complex manufacturing supply chain model that appears in corporate supply chains. in this model, you will notice the second tier of suppliers and more distribution centers and customers. these suppliers supply materials as well as services. you put the manufacturing at the center and suppliers of components to the immediate left the Tier one suppliers have their own suppliers in tier two, for example, tire one supplier might be a wholesale food distributor that purchases flour from it’s own supplier. This supply chain for flour starts from farmers wheat field which is supplied to the food distributor processed in a plant shipped to wholesalers and distribute it to the stores. no matter how far you travel toward the left, you will never run out of new tiers of suppliers. primary product flows from left to right and primary cash flows from right to left. initially the supply chain model was developed for manufacturing but the service industry has supply chains too. a few examples of services industries our electricity provider, legal adviser, real estate, construction, software house, and even federal government. in its broadest sense service industries include all organizations except farming, mining, and manufacturing. below exhibit illustrates the supply chain of an electric utility it receives products services and supplies and dispenses its services to home customers, commercial customers and to other utilities. Firms generally pursue one of the two types of supply chain management vertical integration and lateral or horizontal integration. it is an arrangement in which the supply chain of a company is owned by that company. usually, each member of the supply chain produces a different product or market specific service and the products combine to satisfy a common need. this structure still persists in some companies. vertical integration enterprise may grow from an entrepreneurial base by adding departments and layers of management or through mergers and acquisitions for example in an attempt to create a self-sufficient enterprise, Ford owned iron ore mines steel mills, a fleet of ships, manufacturing plants and showrooms that built and distributed the Ford cars. it is an expanding of a business by acquiring a similar company in the same industry. it is contrasted with vertical integration where company produces different items which are related to one product. the company may do this via internal expansion, acquisition or merger. the process can lead to monopolies if a company captures the vast majority of the market for that good or service, for example, a company that manufactures shampoo may add other brands to appeal to a wider customer base. Its primary advantage is controlling no dependency for components or services. operations can be synchronized with other company functions. They achieve economies of scale and scope they focus entirely on particular business so develop more expertise and they know their market well. when a company wishes to grow through a vertical integration it is seeking to strengthen its supply chain reduce its production costs capture upstream or downstream profits or access downstream distribution channels. however, when a company wishes to grow through a horizontal integration it is seeking to increase its size, diversify its product or service, achieve economies of scale, reduce competition or gain access to new customers of the same market. The advances in supply chain management are reflected in each supply chains development, there are typically four or five sequential stages globally and within organizations starting from state zero to four they are stable, multiple dysfunction, semi-functional Enterprise, integrated enterprise, and extended enterprise. every organization falls somewhere within these five stages. some companies shelter from changes so they are less advanced some took advantages of changes and some organizations to believe that they are in the most advanced stage. the nucleus organization lacks internal definition in goals there are no external connections other than a few transaction links. below exhibit illustrates the lack of coordinated flows of information or solid relationships among potential partners such organizations have unplanned activities, more threats, less forecasting, demand and supply issues, and poor payment flows. at this stage nucleus organization begins to improve effectiveness, efficiency and quality within functional areas as explained in a below exhibit information flow has been improved and functional areas have been defined, however, departments perform their functions one after the other. there is no collaboration between various departments and no partnership formed with customers and suppliers. these organizations are fully integrated between departments using enterprise resource planning or ERP. this is a preload to end-to-end supply chain management as explained in below exhibit, individual firm begins to focus on business processes rather than compartmentalized functions. corporate wall links supply chain partners together. the firm integrates its internal network with the internal networks of supply chain partners in order to improve efficiencies product or service quality or both, exhibit shows the advancement this structure allows complete sharing of information across integrated networks and team building and planning across corporate boundaries. Supply chain management is the management of the flow of goods and services, it includes the movement and storage of raw materials, work-in-process, inventory, and finished goods from point of origin to point of consumption. every product that reaches an end user represents the cumulative effort of multiple organizations some organizations have only paid attention to what was happening within their four walls while some did not but the entire chain of activities ultimately delivered products to the final customer, the result was disjointed and often ineffective supply chain.